In 2018, an experiment was run at the IOP farm in Tanzania. Four nutrient management treatments were combined factorial with two tillage options. The results show that the lowest maize yield was obtained under conventional tillage without fertilizer application, and the highest with reduced tillage and NPK fertilizer to target 70% of water-limited yield and the addition of micronutrients. A number of field visits was organized, and from the six villages surrounding the farm, hence a total of 120 farmers made at least 4 visits to the farm, one every month between February and June. That brings the number of farmers that learned from the 2018 trial to 480+. In addition, the Tanzania Uhuru Torch made a stop at the Trial, to recognize the importance of the training tool for the farmers. During this festive day a large array of different stakeholders visited the farm, such as village leaders, region and district level leaders and young and older farmers. Mtakwa P, Brentrup F, Assey P, van Loon M, Hijbeek R, ten Berge HFM, van Ittersum MK. 2018. 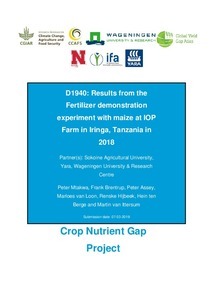 D1940: Results from the Fertilizer demonstration experiment with maize at IOP Farm in Iringa, Tanzania in 2018. Wageningen, The Netherlands: CGIAR Research Program on Climate Change, Agriculture and Food Security (CCAFS).